The real preparations really started just 6 months prior to departure. With our house half packed before we left, we decided to take the chance and not rent it out straight away. We would pay for removalists to take care of the remaining gear if we had to. Equipped with a couple of backpacks, a laptop, cameras, and clothes, we set off. On Friday the 22nd of February we left Cairns for Brisbane. Soundwave was our first stop, one of Australia’s biggest music festivals; and no wonder when the line-ups seemingly get better each year. Metallica, Linkin Park, A Perfect Circle, Offspring, Garbage, Sum41, Killswitch Engage, Stone Sour, and more, all at one event in one day? It was our first big music festival and it won’t be our last. Definitely the perfect start to our trip! I’m a big fan of Metallica, who were undoubtedly the biggest name at the event, however I’d seen them before, and so my favourite of the day was definitely Linkin Park; especially since they slipped some Collission Course in for good measure (no sneaky appearances from Jay-Z though). After some hiccups finding our way back to the train, we decided to walk back to our accommodation; a trek that took us around 30 minutes, and set us up for the rest of our trip. This was it, the day our trip really began; we could hardly wait to get on that flight. Singapore Airlines Flight 236 to Singapore, then Flight 368 to Milan (who doesn’t enjoy a stopover at the Singapore International Airport, with it’s free wifi and massage chairs). We joked that our seats looked like the cockpit, however the best part free alcohol (here’s a tip, try the Singapore Sling). … and the food wasn’t too bad either. We tried to get as much sleep as possible since skiing the Italian side of the Swiss Alps was our next stop; it was important to be feeling good to make the most of our visit to the Matterhorn! However we also made good use of the digital entertainment system (the cockpit) to catch up on some movies and TV shows. Entering into the arrivals lounge, we were greeted by my brother and his mate who had flown in the day before. As we stepped out of the airport, the first thing we noticed was snow, in Milan; we weren’t even near the Alps yet! No time to explore today though, we found Piero our driver, who would take us from the Malpensa Airport (MXP) to Antey-Saint-André in the Aosta Valley in a reasonably new Range Rover Vogue. Piero didn’t speak much English, but that was ok, we were in awe of our surroundings and there was a lot to take in during our 2 our trip. It snowed most of the way there; the first sign that it would be great skiing conditions! As we drove through the relatively small town of Antey-Saint-André where we would spend the next few nights, it felt almost like the small Italian influenced towns back home (Babinda, Innisfail, Mareeba, Atherton); yet the landscape surrounding us was amazing, steep cliffs and tall snow capped mountain peaks. It was all a little bit surreal. Our accommodation, La Gran Becca, which appeared to be less than 5 years old, had no doubt modeled after a traditional “log cabin in the snow”. After some initial mucking around, and a short trip downtown to get some locally baked lunch while we waited for our room to be cleaned, we were able to move in to the somewhat “cozy” unit with its single combined kitchen and living area, a bedroom with a double and single bed, and a combined bathroom/laundry. It wasn’t big, but it didn’t matter! With everything sorted, it was time to track down some supplies and hire some ski gear. Not far away we found Du Elle Sport, which is run by a local couple that spent lots of time making sure we had all the right stuff. We all started with skis, except for my brother, who picked up some snowshoes to try some hiking (since he was still recovering from an arm wrestling incident…). While downtown we also took a trip to the local supermarket for the essentials, some food, beer, and a 2L bottle of red wine of course! The next morning we were up early to make the most of our first day. After a quick breakfast, we caught the local bus from the nearby stop up to Cervinia, the town at base of the slopes. The trip took about 30 minutes, and we travelled through a number of other small towns on the way up, passing plenty of grocery stores, gift and flower shops, delis, and even a formaggeria (cheese shop)… I could live here. Cervinia is a cozy little snow town with cafes, bars, restaurants, and ski hire shops, connected by a maze of little roads, footpaths, and pedestrian bridges; all with snow covered alps as a backdrop. After a short wander it was time to prepare for the slopes and find our ski legs, so we took to the easy runs first to get started. It didn’t take long to get back into it, and after a short time, we decided to head further up the hill towards the Swiss border. We stopped at a ski bar on the way up for panini and cafe’ (espresso coffee) for lunch, before continuing our ascent. Being Australian, it is an absolutely weird feeling to be able to stand with one foot planted in one country while the other is in the next. It’s not something you can do unless you leave our continent. With a few short runs and exploring behind us, we then decided to head higher up the mountain and find our way across the border into Switzerland. You’ll question your own existence, it feels like death! – A Friend. If you’ve ever been to Far North Queensland Australia and did some adventuring south of Cairns, you most likely would have spotted Bartle Frere. As part of the Bellenden Ker Range, it is the tallest mountain in Queensland, and the 4th of the tallest mountains by state (not the 4th tallest in Australia though); a peak that can rarely be seen from the base due to the 360 day cloud cover (informed wild guesstimate). There are two ways to approach the summit, but since we were closer to the coast we started from the Josephine Falls carpark at an elevation of 100m above sea level. We began the trek around 7:30am and the first part, which takes you to the Big Rock Campsite, was pretty easy going, a rise of 400m in just over 3km. There are plenty of places to refill water bottles along this part of the track, and we even had to undertake a balancing act across a log to get to the other side of a large creek; which was even more interesting on the way back (heavy packs + exhausted muscles + balancing on logs, is not exhilarating). At the Big Rock campsite the trail splits, and you can choose to climb up to the Broken Nose lookout (which is easy to spot from the Bruce Highway due to it’s unusual shape) at an elevation of 962m, or continue up to the Summit. Since we had planned to camp at the summit overnight, we figured we had time to do both. After a short rest, we unhooked our smaller packs, packed a bit of food and the cameras, and stashed the larger packs behind some rocks. Then we were on our way up the next 400m rise. This time it was over a distance of 2km, meaning that there were some pretty steep parts along the way. This wasn’t the first time I’d been to Broken Nose, I had done so once before when I was just 9 years old. However it was well worth doing again. The view from here is arguably better than any others further up the main summit trail! As you step out onto the main rock you’re greeted by beautiful coastal landscape views of small towns, sugar cane crops, mountain ranges, and even the coral sea and the islands just off the coast. One part of the lookout has a rock on a slight rise that you can lay across to look straight down over the side; doing so really puts your location into perspective. The main rock at the lookout is a great place to stop for lunch; you won’t get any better views than from here, so it’s definitely recommended. After lunch, we began our descent back to the Big Rock campsite. During which, the bottom grip of one of my shoes started to peel off; and part way down it pulled off completely. Luckily for us though, duct tape does indeed fix everything, and we were able to make (multiple) running repairs (over the remainder of the hike). We arrived back at the Big Rock camp site at around 1-2pm, stopped for another quick snack and to refill the water bottles, picked up our larger packs, and started the next ascent. Just as we began the next climb, we ran into a friend coming back down (he had bypassed Broken Nose and gone straight for the Summit at around the same time we did in the morning). His words of wisdom? “You’ll question your existence, it feels like death”. Great! Onward we go! It felt like death. We probably should have skipped the Broken Nose side trip and just concentrated on the Summit… There was no turning back though, and even though we were still climbing as the sun was setting (lucky for our LED torches and headlamps! ), we made it. On a side note, do not check the altimeter on your camera if you know the altitude you need to reach. As we approached the Eastern Campsite, we had to do a bit of rock scrambling over large granite boulders, an interesting experience at night with hiking packs on; but when we arrived, the euphoria was indescribable. The terrain as you get close to the Eastern Campsite is eerily different to anything you experience on the path up. Described as a cloud forest, it contains many rare plants and animals, of which some species in particular are found only here. It really feels like you are somewhere else. There is a small aluminium shelter, enough to fit about 3 people in comfortably, and an aluminium frame helipad there as well. Unfortunately, by the time we arrived the shelter had been taken, though we only discovered that after we opened the door on the poor guy that was asleep on the ground. It is definitely a good idea to try and use it if you can though; get there early! The Eastern Campsite isn’t exactly the top, but it is the best place to camp. As the remaining sunlight disappeared and it started to cool down, we set up on the couple of small sites that were suitable for tents. Dinner consisted of average food, tinned soups warmed by a kerosene cooker with bread, Oreos and Picnics for dessert; and the best atmosphere in the world, an uninterrupted view of the milky way galaxy. Sleep unfortunately, was pretty average. The spot we pitched our tent on was bombarded with wind, and so I was continuously woken by it flapping around. Though it did survive the night at least. It was cold too, but the “0 degree” sleeping bag I had kept me comfortable, not too hot, not too cold. The sunrise however, was unbelievable. If you don’t have “watch a sunrise from an altitude that you can see the curvature of the Earth” on your bucket list, add it now. Our morning meals were similar to dinner, tinned and packaged goods; stuff that was easy to carry. Once we were finished we packed up and stashed our heavy gear in the shelter for the final ascent, which is about another hour from the Eastern Camp. The final leg of the trip consisted of more rock scrambling and trail hiking, but making it to the top really is a bit of an anti-climax. Because of the vegetation at the top, you can’t see much of the landscape except from a small rocky outcrop that has a limited viewing angle. It’s a great feeling once you finally make it though, and well worth the effort to get all the way to the top. We conquered our first mountain! I won’t go into the details of the descent, but its safe to assume that a combination of stiff, sore, and worn out muscles, heavy hiking packs, and a shortage of duct tape made for an interesting return trip. If you decide to hike Mt Bartle Frere, consider doing it during the winter months, just make sure you take some warm clothes. It may be cold at night, but you have more chance of it being cool and dry in North Queensland if you do. Which also means a better chance of having a clear view of the summit, less humidity, and less leeches. I’d also recommend not climbing to the Broken Nose lookout and then to the Summit on the same day, unless you are an experienced hiker. 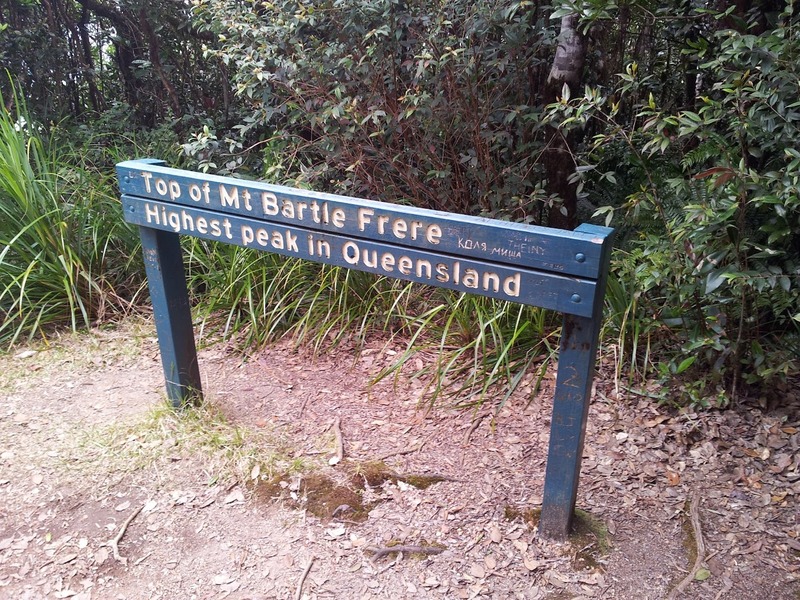 Even then consider it carefully, many experienced hiker’s say that the Bartle Frere hike is one of the hardest they’ve ever done. You can always make the trek a few days and camp at the Big Rock Campsite and then the Eastern Camp. Plenty of water and electrolyte formula. First aid kit (band-aids, compression bandage, antiseptic, etc). Bushman Bug Spray, it’s good for leeches and bugs. Easy to carry healthy foods. Tinned tuna, sliced bread, nuts and dried fruits, muesli bars, etc. An LED torch or headlamp. Plenty of water and electrolyte formula (no that’s not a typo). A spare set of clothes (which can also double as a pillow). Extra food (a simple kerosene cooker and tinned soups, spaghetti, or baked beans are great). Above all though, be prepared, rest up the night before and start early; preferably at dawn, as this gives you plenty of time if you do end up in an emergency situation. Oh, and don’t forget the duct tape! Old man Seawright and I were recently invited to visit the Sugar Mills in Fiji as guests of the Fiji Sugar Corporation (FSC) to consult on some of their engineering projects. It was kind of a big deal since FSC employs roughly 25% of the population and the Chairman reports directly to the Prime Minister. Before stepping off the plane I would never have thought the place would remind me so much of Far North Queensland, Australia; but it does. As we descended the steps of the plane to the tarmac; we could see the palm trees, sugar cane crops, and mountain ranges strewn across the landscape… and of course it was raining. Once we were inside the terminal however, the similarities ended, and it became pretty clear that we weren’t in Kansas Cairns anymore. Although our arrival in Fiji wasn’t our first interaction with the locals, it was definitely our first real experience with the culture (flight attendants don’t count). As we walked through the terminal towards customs we were greeted by a group of musicians dressed in tropical attire and playing traditional music. They were happy, and they weren’t the only ones. From the customs officers, to the security guards, the hotel receptionists to the tradesmen and apprentices in the mills; almost all of the locals we met were happy. While we toured the mills we had a constant stream of people coming up to us to shake our hands and say hello, or bula (pronounced “mm-boola”) as the locals say. Of course, most people that visit Fiji probably say the same thing; although most people also stick to the tourist destinations too, the plethora of resorts, the markets and cafe’s, and the reef and adventure tours. Our work however, took us off the beaten track; we drove almost 3/4 around the coast of the main island of Viti Levu (where most tourists stay), took a plane to Vanua Levu, and visited all 4 sugar mills in the country. I’m certain that while we were in Labasa the entire town knew we were there; we didn’t see any other westerners around, and at one point we were approached by the wife of one of FSC’s employee’s that we had met the day before… just so she could say hello! An unfortunate side effect of everyone being happy in Fiji, is that for the most part, they are also extremely laid back and relaxed. Of course, this isn’t a bad thing if its part of your culture and it makes you happy, but it got pretty frustrating for us on occasion since we weren’t used to it… Part of our trip had us supervising the repairs of a wood chipping machine that had broken down the week before we arrived. We had to design a special tool to fit the replacement rear main seal on the engine since John Deere wouldn’t sell it to us. This was something curious we noticed about the professional culture in Fiji; people in positions of authority are often referred to by their position title, or the acronym of the title. So whereas in Australia we refer to our Prime Minister by their name, Frank Bainimarama (the Fijian Prime Minister at the time) is often referred to as “PM”; we also heard “Chief” for the Chief Engineer, “the Chairman” for the Chairman of FSC, and “CE” for Civil Engineer. For us “tourists” it got a bit confusing if you weren’t paying enough attention, especially by the time we got to the last mill (a lot of the positions are duplicated across different organisations). “The tail is wagging the dog”; pretty obvious, this one was in relation to organisations or teams. The bottom rung employees of the organisation are controlling what is happening rather than the top. “Jungle in jungle out”; was a reference to the branches and trees that were used to replace the mill cut timber on the loco trucks by some of the farmers.Rather than replacing them when the trucks were back at the mill, the maintenance crew would simply send it back out the way it came in. Unfortunately while we were in Fiji we came across some examples of what we believe was likely corruption (non-government related). Most of it directly involved money (but then, when doesn’t it? ), where little schemes kept the back pockets of certain individuals lined. The current Prime Minister seems pretty intent on ensuring that things change however; which was great to see. The Fijians we spoke to about it were concerned and dead against it as they understand that in the long run it is bad for the country. One of the most genuine people I’ve ever met was a descendant of one of the the founders of the mill in Vanua Levu, who, when asked about corruption, could keep talking about it until you wanted to change the topic. I’m sure he’d pinched a copy of every one of the “anti-corruption” posters he could find and put them up throughout his office as well! Have you been to Australia? Did you get sunburned while you were there? Well if you live in FNQ you’ve no doubt be sunburned (more times that you probably should have). However while we were in Fiji it didn’t happen. We were often in the sun for an hour or so at a time without sunscreen (or even a hat), yet none of us got sunburned once. For most people, 20 minutes in the sun in Australia is usually enough for a minor burn. It just goes to show just how much of a problem a hole in your ozone layer really is; especially when it is right above you. Fiji was a great country to visit; the interesting mix of Island and Indian cultures supported by a community based around agriculture and tourism is definitely something different. There are some absolutely beautiful sights and places to see as well; and most things can be had fairly cheap (main meals for around AU$12-15, drinks for AU$3-6, for comparison) depending on where you go and what you want to do. For the real cultural experiences though, you need to get away from the tourist locations; most people won’t want to, but it’s worth having a bit of a wander (or drive, if you’re feel adventurous!) around. Time wise, you probably wouldn’t need more than a week there unless you’re just planning to laze around on the beaches or at the resorts… then it really depends how long you can do nothing for. For me though, that isn’t very long!